Thyroids – who needs them!? What do you have (or most of you have) that I don’t have? If you guessed a thyroid – you would be correct! I was born without one. A little fact for you, is that I was the first baby found in Queensland to be tested and found to be without thyroid as a baby. I am so famous that my name can actually be found in the medical books to prove this if your wondering! Thanks to me, all babies are now tested for thyroid issues after birth – this test is done in correlation to the heel prick test. This little organ, the majority of the human race has – has many super powers, and when you don’t have one, you literally live your life without super powers. Life can be very challenging. When I was younger I used to think of the positives in being hypathyroid – at least you were probably going to be skinny, rather than a bit chubby! So if you have never heard of this little organ before you will probably be wondering what it is? The thyroid gland is a precious butterfly looking little organ that plays a critical part in your life and when you don’t have one…well lets just say that life can feel very ordinary at times. Now there are many different thyroid conditions, but the two main issues you could face if you have a thyroid issue is one called ‘hypathyroidism’, and the other is ‘hypothyroidism’. Because I don’t have a thyroid gland, mine is hypothyroidism. I have an underactive thyroid. When I read the words lethargy and fatigue I don’t really get a sense for the meanings of the words, but then I can tell you that as someone who does not have a thyroid gland, the words lethargy and fatigue is not just feeling a little tired. In fact, the idea of being a little tired sounds nice in comparison to the exhaustion one feels some days. I know some of my readers will say ‘you must be exhausted – you have 4 kids!’, and I will reply to that. At different times in my life when my medication has been out, I have a similar exhaustion. I have issues with losing weight, and all I have to do is look at the chocolate to gain weight – I don’t even have to eat the sweet stuff to put on weight. I have felt like I have lived my entire adolescent and adult life on some type of diet, and nothing has really helped me. However in saying that. Today is a new day and a new day always means a chance to make good decisions. Good health is a consequence of good decisions. I have learned so many important life lessons with regard to having a thyroid issue, or should I say, lack of thyroid. One of them is that this condition is genetic. If you are related to me – you should probably go and get yourself checked for a thyroid condition. You may also be interested to get your children checked out. The second issue with a thyroid test is that when you get the results back from your tests, you need to find out what normal actually means. Your result may be on the low side of normal, and in this case you may want to get a second opinion. You may actually have an issue with your thyroid gland. Unfortunately, it seems from my experience over the years that when my blood work has come back to the doctor for review – its in the normal range, but on the low side or then on the high side. Doctors like to readjust the medication, but if you know for your body that you actually need more medication to feel as though you are functioning right, you need to find a doctor who will understand the ins and outs of it all. Many GP’s don’t fully understand what the test results for thyroid actually mean so you may need to shop around for a bit till you find a doctor who actually gets it – and then keep him or her – don’t let them retire! As I get older, the thyroid issue becomes more and more important and I want the next so many months and years to be positive. I plan to take the kids again for another thyroid check. I must admit that I am a little paranoid when it comes to the kids and thyroid issues as I understand how growing up with such a condition can play havoc with you. My advice is that if you feel sluggish and tired, you can’t lose weight, you put weight on easily – then go get checked out, and while your at it – get your kids checked. 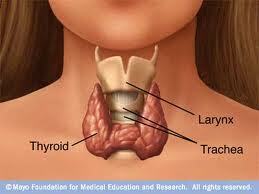 Its better to get checked and not have a problem, than it is to not get checked and have a thyroid problem. You have to know what your dealing with! Anyway, I am stepping down from my soap box now to get ready for the kids pick up time. I think I may have a borocca in my Gloria Jeans cup – I don’t have a problem with that, do you? ← Is it financially viable to be a Stay at home Mum?